Dishonest SLFP and UNP MPs have already conceded that they have abused government tax revenue under the guise of tax-free permits. The State Minister of Finance recently said that he has been doing it for a long time whilst Bandula Gunawardane, MP declared that there is nothing new about cash-trapped MPs selling their car permits. MP Udaya Gammanpila was also caught red handed after the vehicle imported on his permit registered by a private company. The JPV MPs on other hand talk about integrity and morality in politics claiming that they are committed to preserve and protect the public property and to combat corruption. They make always make noise in the parliament about the waste and corruption in the government business. Now evidence in the public domain reveals that all JVP MPs are trapped in the Finance Minister, Ravi Karunanayake’s tax-free car permits and Rs 100,000/- bonanza offered to lure MPs to please them and to keep them under control. 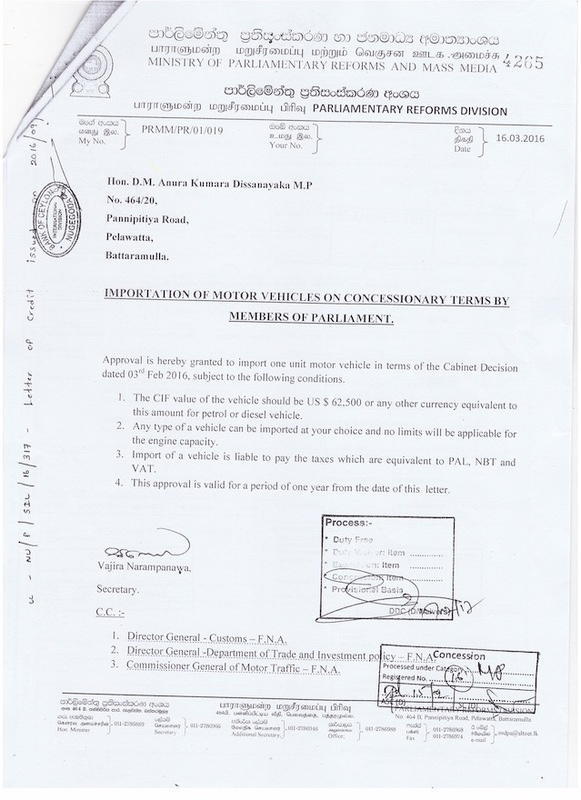 Colombo Telegraph already revealed that all JVP MPs, includling Anura Kumara Dissanayake, have made use of the tax-free MP permits offered by Finance Minister Ravi Karunanayake to import 6 Toyota Hilux vehicles, which they have imported and cleared out of Customs on the same date. 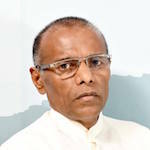 It is deemed that the Head of the COPE Sunil Handunneththi and other JVP MPs are aware about the Parliament’s authority in the Public Finance as sets out in the Constitution, which states that no tax or levy can be charged or any levy already imposed on any commodity can be exempted except upon the authority of a law enacted by the Parliament. However, it is observed that all tax-free car permits for MPs have been issued in February and March 2016 with no legal sanction whatsoever, authorizing the exemption of statutory levies chargeable on the vehicles. For instance all 6 permits issued to JVP MPs have been issued in February/March 2016. This was a deliberate ploy on the part of the government and it never expected any one to question the legitimacy of the issuance of permits. After this issue was raised for the first time, the Finance Minister issued a gazette notification on 02nd May 2016, legitimizing of the issuance of tax-free car permits, which was done under the provisions of Excise (Special Provisions) Act No 13 of 1989. However, by then all permits have been issued in February/March 2016, which were invalid for want of legitimacy. Investigation conducted into the gross abuse of public funds through these permits have revealed that already 38 private individuals have imported and registered expensive vehicles on these invalid permits in the names of several Ministers and MPs. It was also revealed that more than 100 vehicles have been imported on these permits and a large number of such vehicles are been used by their new owners in the name of the permit holder MPs, without effecting the transfer, which is also prohibited and amounts to a punishable offence under Section 12 of the Motor Traffic Act. The law requires the new keeper/owner to apply within fourteen days after change of possession to be registered, as the new owner shall be guilty of a criminal offence with power conferred on police to detain such vehicles use on a road. Further to in-depth investigation into this day light robbery it was duly reported to the Corruption Commission with overwhelming evidence of the abuse of public funds for unjust enrichment by the corrupt MPs and Cabinet of Ministers in the 8th Parliament. Under the law the Corruption Commission is required to carry out an independent and credible investigation into this complaint, which however never occurred, compelling the Corruption Commission to be charged before the Supreme Court for condoning Corruption. Further to the filling of this writ application (SC/Writs/07/2016) Notices have been issued on the Corruption Commission and on three Commissioners and the matter is now fixed for hearing on 16th March 2017. In this case it is requested from the Court to direct the Corruption Commission to initiate action to recover all tax revenue defrauded by all dishonest MPs and to charge them for abuse of office for corruption under Section 70 of the Bribery Act, which specifies 10 years jail term for corruption. « Restoring ‘Economic Democracy’: Is It An Elusive Goal?